Describe what high-performance aesthetics are. Explain the finish options with precast concrete. Explain how clay products and natural stones can be veneered to precast concrete to speed construction and reduce costs. Discuss the latest innovations in aesthetics and finishes, including thin brick and terracotta, and polishing and burnishing. Concrete. A vital ingredient in the built environment that we encounter throughout our day. While concrete can be found occupying the role of unsung hero in essentially all structures, as a design medium, precast concrete truly embraces a diversity of color, forms, and textures, making it a high-performance material, especially in terms of both sustainability and aesthetics. A high-performance structure is one that integrates and optimizes all relevant attributes on a life-cycle basis. This means that we are being challenged not to just build a structure that meets codes, but one that is the best structure it can be for the given location and circumstances relative to that particular project. Designers should look for ways to truly leverage the benefits of the materials and systems they use, which often go beyond the original intent for a material. For example, precast concrete can serve as the enclosure, providing the aesthetics and thermal, air, and moisture management systems, but also contribute to the structural system. As a high-performance material, precast concrete contributes to the overall high-performance goals of a building. It provides energy and water conservation, safety, security, durability, and accessibility; and meets cost-benefit, productivity, functionality, and operational considerations. Yet, the term “high performance” challenges designers and owners to go beyond optimization. It embraces other key concepts, including the performance of the structure in the long-term and through life-cycle costs. Furthermore, it encompasses sustainable design and sustainability. 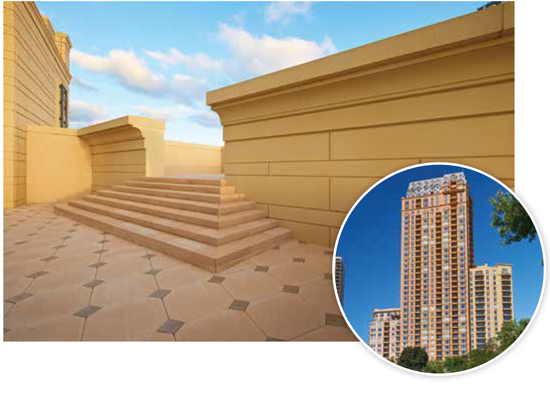 Precast concrete integrates and optimizes all major high-performance attributes on a life-cycle basis. It integrates easily with other systems, and inherently provides the versatility and efficiency needed to meet the multi-hazard requirements and long-term demands of high-performance structures. 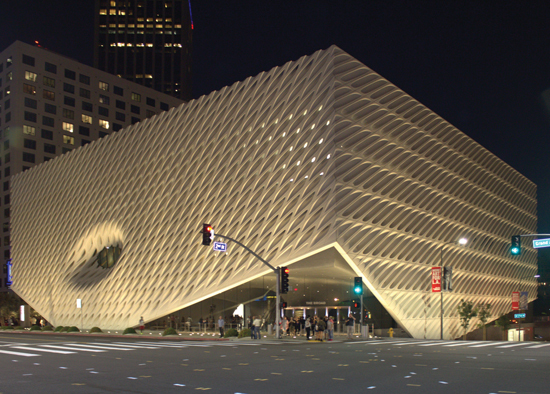 The Broad Museum’s new wedding veil facade is comprised of more than 2,500 unique pieces of glass fiber reinforced concrete. This project showcases the aesthetic versatility, precision, forming, light, and sculpting ability of high-performance precast. The enclosure is designed to allow sunlight to enter the building, but without the light directly striking any of the art work inside. In addition its high-performance attributes, precast allows designers to create a wide range of aesthetic effects and colors, to affordably incorporate historic elements, and to integrate a diverse array of facade elements into a single precast panel. Precast concrete facilitates a tremendous range of colors and textures through the use of formliners, raw materials (i.e. aggregates and cement), and pigmentation, as well as various finishing techniques, such as acid etching and abrasive blasting. Designers can create intricate bullnose detailing, reveals, and custom castings. Designers also can embed or veneer traditional materials, such as thin brick or stone, into precast panels to utilize their natural beauty while gaining the many high-performance benefits of precast concrete. The aesthetic versatility of a material is important, because it allows us to be truly creative while still preserving efficiency. Not only does an aesthetically versatile material offer a broad design palette, but it should also minimize construction complexity, reduce life-cycle costs, be durable and have a long service life; and, contribute to the efficiency and resiliency of the structure. Photo courtesy of High Concrete Group LLC. Precast concrete was used as the enclosure system for this high-end, high-rise, residential building in Chicago. The architect made extensive use of detailed formwork to create extensive balconies, decorative features, detailed cornices, and more. A medium sand-blast finish was used with three different mix designs, resulting in different colors for each of the three towers.